The retention figure is approximate to the number of games played which was 61 at press time for New York. No one may ever know what the hold-up was to this deal as it had been close earlier in the day. Let’s break this down into its parts. The hot stretch Zuccarello went on helped some. He is 31 years old and the age curve is on the other side. Also, the concern is the run of fortune could turn to futility again. Averaging over a point a game for 5-6 weeks is great but how long was that going to last? Jeff Gorton parlayed that run into this deal but there are concerns here. First, Gorton could not wrangle the first-round pick. That seemed a definite possibility earlier on Saturday. Instead, the Rangers’ general manager needed conditions attached to the deal. Second, some were hoping for a prospect, perhaps Denis Gurianov, or someone else. That did not materialize either. The best Gorton acquired was the second-round pick. This is being realistic. Finally, the retention of salary is almost negligible. It comes down to around $300,000-$350,000 from the remainder of the year. This depends on the final math of games played. Dallas winning two rounds when they are outside of a playoff spot seems remote. The other aspect is would Zuccarello re-sign in Dallas? Currently, that also looks not to be likely. Stranger things have occurred. Martin Hanzal placed on Long Term Injured Reserve to make the deal possible. Dallas will then announce a roster move to get back to 23 players. 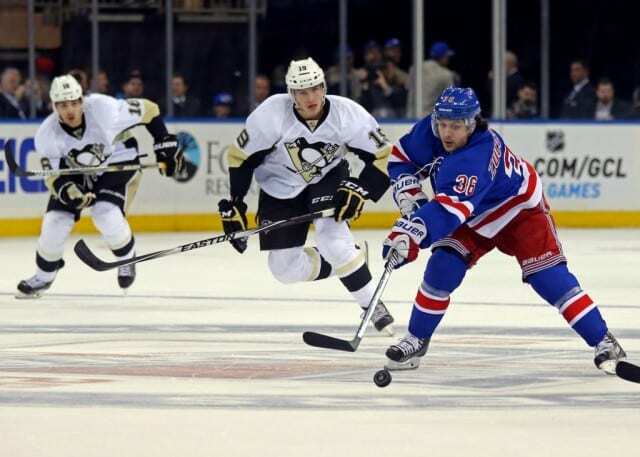 By the way, Zuccarello adds a dimension of speed and ability on the power-play. He has 14 points on the man advantage. One major concern is the amount of time Zuccarello has seen lately. His overall average time of ice is over 20 minutes now. He never saw 19 minutes in any season. His career high was 18:55 last year. Over the last five weeks, Zuccarello played 21+ minutes a night. Does that have an effect down the stretch? Does Jim Montgomery and the Dallas Stars place him on the second line but top power-play unit to start? That becomes a plausible reality. The 37 points in 46 games is great but Dallas’s power play needs help (16th in the NHL at 19.9%). Their second-line scoring was even more of an issue. The hot streak pushed Zuccarello’s possession metrics to nearly 3% above the team average. How much of that was driven by Mika Zibanejad? Dallas will find out quickly. Who centers Zuccarello may determine his success or failure in Dallas? Will it be Seguin or will it be Radek Faksa/Jason Spezza/Mattias Janmark? Currently, projections indicate Zuccarello will start on the second line. Playing with Jamie Benn may help Benn at least. Benn struggling with consistency and shot selection may get a boost from having a speedy winger flanking him. At the very least, space created for the left winger is a bonus. Benn’s scoring chances rising upward is likely in this scenario. If Zuccarello is moved up to the Tyler Seguin line, that could be one dangerous trio. Again, Mats Zuccarello cures only one or two issues for Dallas who needed a second-line center as much or more so. Jim Nill indicates that Dallas is finished for the trade deadline. Can Dallas, as constituted, beat two Western Conference teams? That answer is not likely. Dallas must make the playoffs first. Furthermore, can Dallas re-sign Zuccarello? Unfortunately, Dallas has a lot of cleanup work with several RFA’s and UFA’s. Do they want to get younger is another question? There’s a growing chance the New York Rangers wind up with just a 2019 second and 2020 third for their troubles. However, they do have Kevin Hayes, Adam McQuaid, and maybe Chris Kreider to go.